Be the first to share your favorite memory, photo or story of Craig . This memorial page is dedicated for family, friends and future generations to celebrate the life of their loved one. Craig M. Thomas, 59, of Ninilchik, Alaska died at 3:33 PM on Jan. 31, 2019, at South Peninsula Hospital just two weeks shy of his 60th birthday. He was born in Schenectady, New York. Craig served as an NCO for over a decade in Germany, Texas, Washington, Alaska, and the global theater with the U.S. Army Nuclear Chemical Biological Engineers receiving his honorable discharge in Dec. 1989. He met his soulmate, Mariah, in 1995 while both volunteered with the 1,000 Mile Yukon Quest Sled Dog Race where he held a position on the Quest Board and as the Assistant Race Manager for two years. They married Jan. 2005 at the George E. Wahlen VA Medical Center in Salt Lake City, Utah while Craig was preparing to undergo heart transplant surgery. They made their home in Ninilchik, AK where he worked as a heavy duty / light engine mechanic, but also accompanied his wife, an educator and school principal, across Kachemak Bay to Seldovia, the Kuskokwim village of Tuluksak, Point Hope on the North Slope, and other remote locations with their dogteam; ultimately combining their dogs with the Tuluksak School dogteam to compete successfully, placing 10th, in the Centennial 2008 All Alaska Sweepstakes where Craig provided extensive snowmachine support on the 400 mile race trail from Nome to Candle and back, a mere two years after being released from the transplant facility. 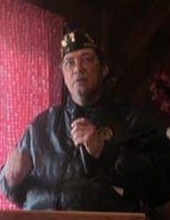 Craig was an active member and Vice Commander of the American Legion Post 18 Ninilchik. Craig enjoyed community events including volunteering at checkpoints and staking trail for the K300 and T200 sled dog races and as a Salmonstock/fest Campground Host and Beergarden Security. He is survived by his partner of 24 years, Mariah; stepson LifeMed paramedic Zachary Dalton Wolf Schindler; son Terry Lee Thomas, wife Sandra and their four children Selina and her 3 year old son Luca, Ren'e, Denise, Vanessa, and Melinda all of Marktbreit, Germany; and daughter Jennifer Halfpap - Thomas, husband Michael Halfpap and their three children Andre Thomas, and Alisha and Aliyah Halfpap of Marktsteft, Germany. Craig is predeceased by his father Walter Craig Thomas and survived by his mother Colleen Patricia Simmons of New York, sister Lisa Thomas-Sachar, husband Phil Sachar and their son Damien Sachar of Arizona; sister Kelly Best, husband Walter Best and their children Adrian and Tiffany Lynn Best of New York. And his four remaining beloved sled dogs Bud, Seed, Lupa, and Bishop. Catholic services, military honors, and a celebration of life will be announced and held at a later date in Ninilchik, as well as a Native American ceremony in Homer, AK to send him home. "Email Address" would like to share the life celebration of Craig M. Thomas. Click on the "link" to go to share a favorite memory or leave a condolence message for the family.